At an elderly age Porphyry the Neoplatonist married Marcella, a widow of a close friend who had seven children, but shortly thereafter he was called away, urged on by the gods, to attend to the affairs of the Greeks. 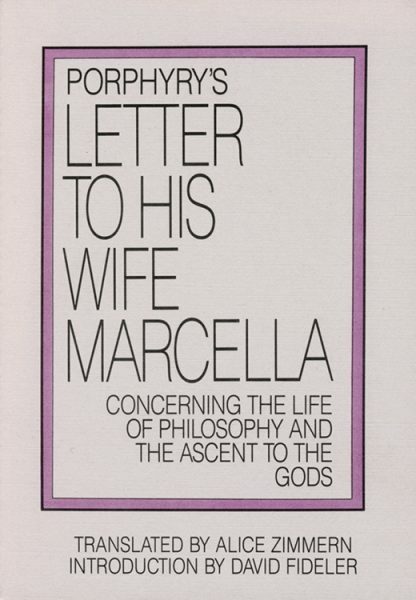 Out of print for nearly a hundred years, Porphyry's Letter to Marcella is a personal and moving document. In addition to explaining why he chose Marcella as his partner in marriage, Porphyry consoles his wife and reminds Marcella not to neglect the life of philosophy, conceived of here as the care of the soul in its re-ascent to the One. Porphyry writes of how God is best honored and of the divine principles which must be upheld by the philosopher in daily life. He notes that "no things can be more entirely opposed to one another than a life of pleasure and ease, and the ascent to the gods." Porphyry here describes the preparatory stages of that ascent, and how the ascent is accomplished.